Connecticut's Gabby Williams, right, poses for a photo with WNBA president Lisa Borders after being selected as the No. 4 pick by the Chicago Sky in the WNBA basketball draft, Thursday, April 12, 2018, in New York. Three former UConn Huskies were selected in the first round of the 2018 WNBA Draft Thursday night. Forward Gabby Williams was selected by the Chicago Sky with the fourth overall pick. 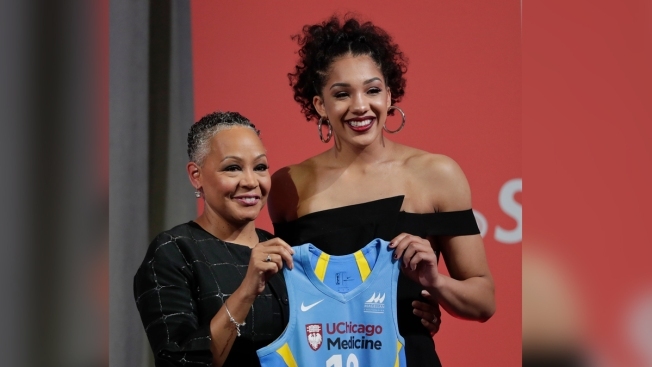 Forward Azura Stevens was selected by the Dallas Wings with the sixth overall pick, and guard Kia Nurse was selected by the New York Liberty as the 10th overall pick. All three women come with strong records. Williams was the 2018 Cheryl Miller Award winner and a two-time WBCA All-American. She finished out her years as a Husky as a two-time NCAA champion and has more than 1,500 career points, 1,000 career rebounds, 300 steals and 400 assists. Stevens was named the American Athletic Conference Newcomer and Sixth Player of the Year in 2018. Nurse was named the 2018 WBCA and American Athletic Conference Defensive Player of the Year. She finished out her college career with more than 1,600 points, 400 assits, 185 steals and 395 rebounds. All three girls will join teams that boast former Huskies - Stefanie Dolson plays for Chicago, Saniya Chong in Dallas, and Tina Charles, Kelly Faris, Bria Hartley and Kiah Stokes all play for Liberty. The UConn Huskies have had at least one player selected in the draft 19 times in the last 21 years.